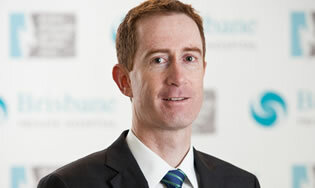 Dr Brett Collins is a Queensland trained Orthopaedic Surgeon practicing in Brisbane. He has a focus on knee surgery, with experience in other lower limb and shoulder surgery. His special interest area is in sports related injuries. This includes knee reconstruction, arthroscopy, joint replacement and osteotomies. Meniscal, cartilage and joint preservation surgery forms a significant part of his practice. Brett completed his medical degree at The University of Queensland in 1999 before joining the Orthopaedic Training Program. He gained his Fellowship in Orthopaedics from the Royal Australasian College of Surgeons in 2009. Subspeciality fellowship training was undertaken in Canada in 2010-11. 12 months was spent at the Fowler Kennedy Sport Medicine Clinic in London, Ontario focusing solely on Sports Orthopaedics with exposure to professional and university athletes. He also completed a Lower Limb Arthroplasty (knee and hip replacement) Fellowship at St Michaels Hospital in Toronto, Ontario. Orthopaedic research activity currently includes investigations in to ACL graft strength and reconstruction techniques, meniscal root repair and the association between ACL ruptures and osteoarthritis. Teaching includes Fellow, Registrar and Medical Student training. Appointments for Dr Collins can be made through his main office at BOSMC. Dr Collins regularly consults at the Brisbane Private Hospital, Sunnybank Private Hospital, All Sports Physiotherapy in Camp Hill, and Westside Private Hospital in Taringa. He operates at both Brisbane Private Hospital, Westside Private Hospital, and Sunnybank Private Hospital, and has a public appointment at the Royal Brisbane and Women’s Hospital, Herston. Visiting Medical Officer appointments: Royal Brisbane and Women’s Hospital. All appointments can be made at the BOSMC Head Office on (07) 3834 6789. Please contact this office for further information regarding billing.